The 2012 NFL Draft began tonight at Radio City Music Hall in Manhattan, New York and for the 32 men selected in the first round of this year’s glorified meat market their lives have been forever changed by hearing their name called and shaking hands with NFL Commissioner Roger Goodell on stage. It is a dream of almost every kid that has ever tossed around a ball or tackled a friend in the backyard to hear their name called at the draft and for their professional career to begin, and for 32 athletes that dream became reality tonight. The players blessed enough to receive a phone call from an NFL front-office before hearing their name read by Goodell and crossing the stage to shake his hand and give him a hug, have a lot of reasons to be thankful tonight. For one, they will be playing a game that many of them truly love, and will be getting paid very highly for their services. According to sports business reporter Darren Rovell, every man who was selected today should be guaranteed at least 6 million dollars. For the top 10 picks, the guaranteed numbers jump up to over 10 million dollars, not too shabby for a young athlete. Besides the money, there is a huge sense of relief as the draft process winds down for these guys, and they finally know where they will be suiting up next fall. From the time that a player declares for the draft, through the combine and the pro days, and the extensive interview process, these athletes face major scrutiny and are evaluated on every detail of their life and how they handle the process. To finally know that the stressful process of being selected is over, these guys can finally get back to focusing on what they are now getting paid to do, becoming better football players and producing results. Football games are not won in the boardrooms used to interview the athletes and points are not awarded for bench press reps or forty yard dash times, but all these procedures are used to evaluate the athlete and try to find a guy who will make your team better. Now that the players have been selected they can start focusing on what is going to make them a better athlete, and what they can do to help their new team win games and they don’t have to worry as much about what image they are projecting. 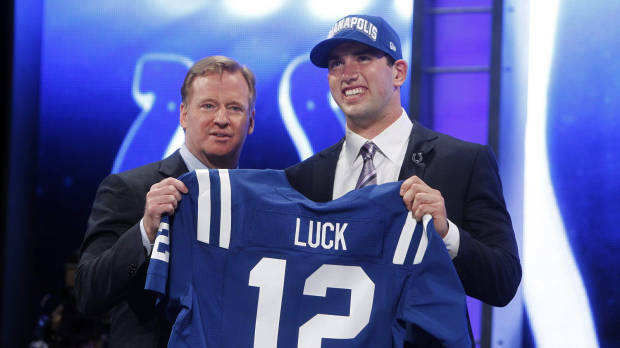 Andrew Luck of Stanford became the first selection of the 2012 NFL Draft. So what happened tonight? Well, the first two picks have been known for weeks. No surprises as two quarterbacks went first, Andrew Luck to the Indianapolis Colts and Robert Griffin III to the Washington Redskins. After that things got kind of wild, with trades dominating the evening. An hour before the draft began, the Cleveland Browns pulled off a trade with the Minnesota Vikings to move up just one spot but assure themselves of running back Trent Richardson out of Alabama with the third pick, and the Vikings happily took left tackle Ryan Kalil from USC with the fourth pick. For the fifth pick, the Jacksonville Jaguars moved up to grab wide-receiver Justin Blackmon and then with the sixth pick the Cowboys traded up to snag cornerback Morris Claiborne. Counting the trade made between the Redskins and the Rams back in March that allowed Washington to acquire RGIII there were four trades among the top six selections, which is a rarity in the NFL. In the past seven years before this one only one trade had been made in the first six selections, so tonight was pretty wacky to say the least. In total, there were 19 trades made in this year’s first round, which is the most the league has ever seen (at least since the AFL-NFL merger in 1970). You can see the run-down of the entire first round here if you are so inclined: http://www.nfl.com/draft/2012/tracker/by-name?module=HP11_cp#dt-by-round-input:1/dt-tabs:dt-by-round. For my favorite team, the New England Patriots, they did something tonight that is very rarely seen from that front office on draft night. They traded up….twice! Originally slated to hold the 27th and 31st overall picks in this draft, the Pats brass did not feel that they could get the players they wanted needed, so they decided to do some dealing. The first trade the Patriots were involved in tonight was for the 21st overall pick which was property of the Cincinnati Bengals. The Patriots traded the 27th overall pick and a third round selection to move up and select Syracuse defensive end Chandler Jones. I’ll admit I do not know too much about Jones, who was originally slated to be a third round pick when he declared for the draft, but impressed at the combine and during interviews with teams, so the Pats felt that they needed to move up to grab him. He is not expected to be a playmaker right away, but does have a ton of upside and is a very versatile player who may fill many different roles during his time in New England. Dont'a Hightower will be a huge addition to the Patriots LB core. The second move that my team made tonight was again to trade up, this time for the 25th overall pick that was owned by the Denver Broncos. 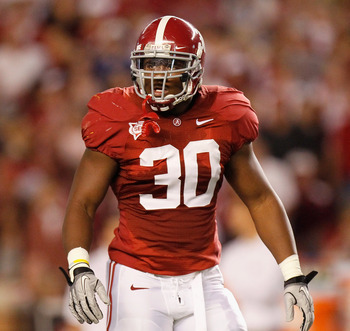 In giving the Broncos the 31st pick and a fourth rounder this year, it marked only the fifth time in the Bill Belichick era in Foxboro that the Pats traded up, and they were able to secure a play making linebacker in Alabama’s Dont’a Hightower. Hightower was widely regarded as the second best linebacker in this draft (behind Boston College’s Luke Kuechly) and at 6’2” and 265 pounds is a run stopping force with very good speed for his size (4.68 40-yard dash). To say that I’m thrilled with the Hightower pick would be an understatement. The NFL Draft resumes tomorrow night with 64 more men begin given the chance to be selected and officially begin their journey of professional football at its highest level. Roger Goodell may not be there on stage to greet every player with a handshake and a hug like he did tonight, but that does not detract from the fact that anyone who hears their name over the ESPN or NFL Network airwaves over the course of the evening has a very good chance to make a team and to make a more than decent living playing a sport that millions watch every Sunday. It is a huge step in an athlete’s career and as fans we have a chance to witness every moment of it. 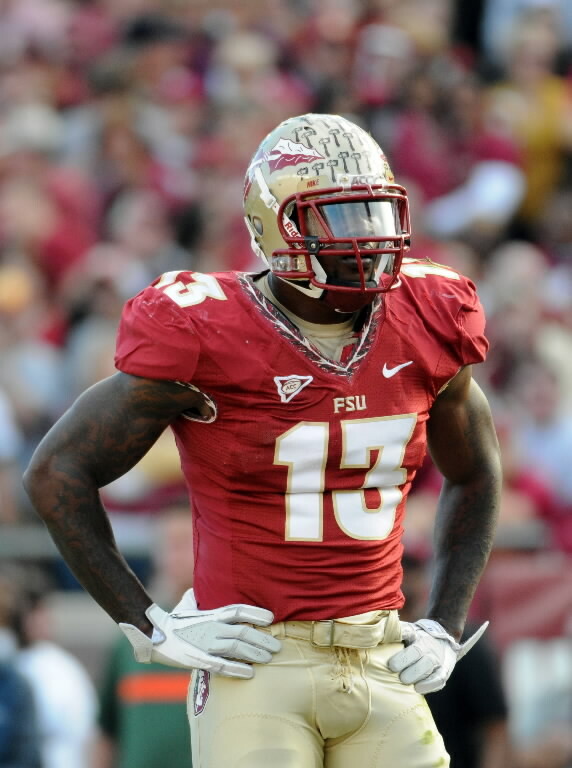 Noles Nigel Bradham is hoping to hear his name called tomorrow night. Tonight no player from FSU, Florida, or Miami was selected in the first round for the first time since 1980. This entry was posted in NFL and tagged Andrew Luck, Football, NFL, NFL Draft, Patriots, Roger Goodell, Sports. Bookmark the permalink. Shaking hands??? Goodell was all-out hugging these guys!